Size: 1 1/16 to 4 1/2 inches. Millipedes have a long worm-like segmented body with many pairs of legs. Their name means “thousand leggers”, but in reality they only have about 30-333 pairs of legs depending on the species. In general adult millipedes are 1/16th to 4 ½ inches in length although some species can be much longer; millipedes are black or brown in color and they may have orange or red markings on their body. Millipedes are nocturnal and can usually be found hiding under rocks, piles of leaves, piles of garbage, and mulch during the day, during the evening hours they will scavenge for food- decaying plants and other dead insects. Millipedes will enter into homes after periods of heavy rains, when the ground becomes saturated with water. They crawl up the sides of foundations, exterior walls, windows and doors and enter through gaps and spaces. Once inside millipedes can be found hiding in dark damp places, underneath of boxes and furniture and in basements, kitchens, bathrooms and in crawl spaces. Millipedes do not bite or sting and are not dangerous to people or pets. They do have the ability to excrete a toxic liquid through spaces along the sides of their body. This liquid can cause problems for small pets and can cause the skin on humans to become blistered or irritated. The liquid can also leave behind a foul smell that needs to be cleaned away. How do I control millipedes? 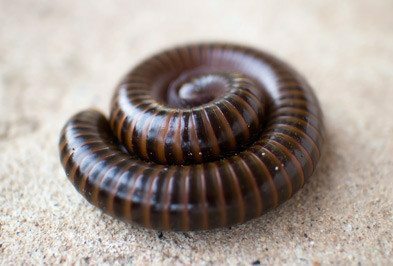 Because millipedes may enter into home in large numbers and hide in multiple areas throughout it, the best way to control and get rid of millipedes from your home is with the help of a professional. At Holder’s Pest Solutions, we stop millipedes and other occasional invaders from entering homes by establishing an exterior barrier. Our EnviroGuard home pest control program provides year-round protection that keeps pests out. How do I keep millipedes out of the house? Millipedes are best kept out of the house by eliminating moisture issues. You should also seal cracks on the exterior of the house and fix gaps around doors and windows. The Texas Redheaded Centipede Goes Viral! Texas Parks & Wildlife posted this picture of the infamous Texas Redheaded Centipede and, as you can imagine, the post went viral. The folks at Texas Parks & Wildlife say this isn't surprising. This is an insect that inspires fear. I mean, just look at it. Would you want that thing crawling across your bed? I didn't think so. Has This Wet Texas Spring Brought You New Pests? Wet weather drives pests into homes, and moist basements make them never want to leave. If you understand these two principles, you may actually be able to reverse the infestation that may already be happening in your home.